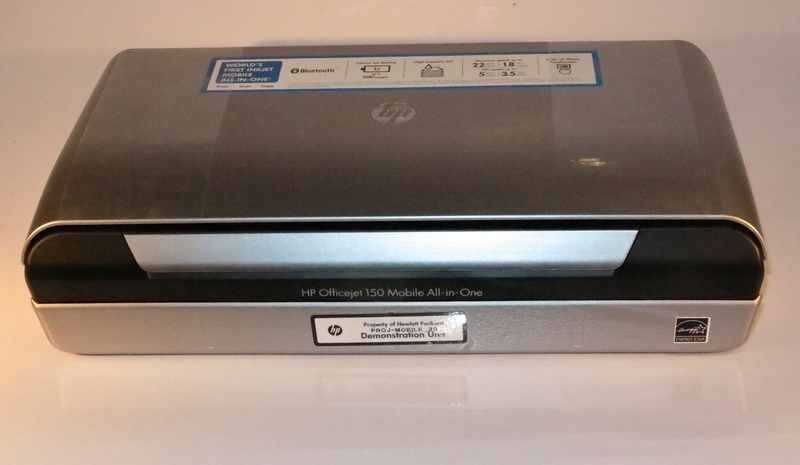 Previously, I had written an article about the HP OfficeJet 150 as being the first mobile battery-operated multifunction printer that could also scan and copy when it was launched in May. Prior to that, if you wanted a device that did this, you may have bought the Canon BJC-80 alongside a scanning-head accessory for that printer. Then you had to swap the printhead and the scanning head every time you wanted to scan a document. There are some workflows where you have to prepare and print a document like a quote, then this document has to be signed or annotated before it is emailed back to the office. This work may have to be done while you are on the road and it wouldn’t be feasible to do this on the road in a simplified manner before the arrival of this machine. As well, this unit’s scanner would allow you to file documents electronically on your laptop or to a USB memory key or SD memory card. It also can become an “on-the-road” convenience document copier. 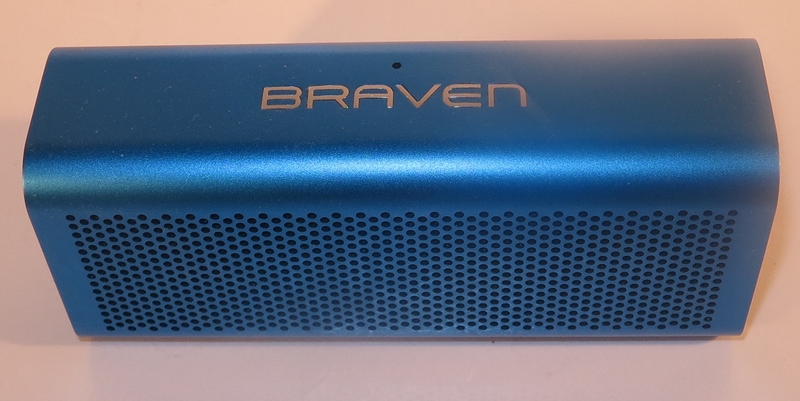 I have now been given the chance to review this printer and assess it as a mobile computing accessory for those of you who work on the road. The HP OfficeJet 150, like the previously-reviewed Canon PIXMA mobile printer is the size of a small “shoebox-style” cassette recorder. 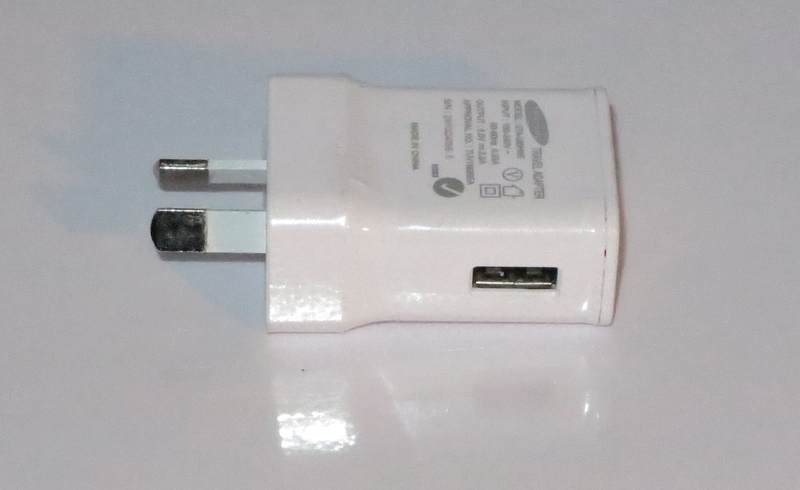 It is able to run from AC power using the supplied power adaptor or from internal rechargeable batteries. 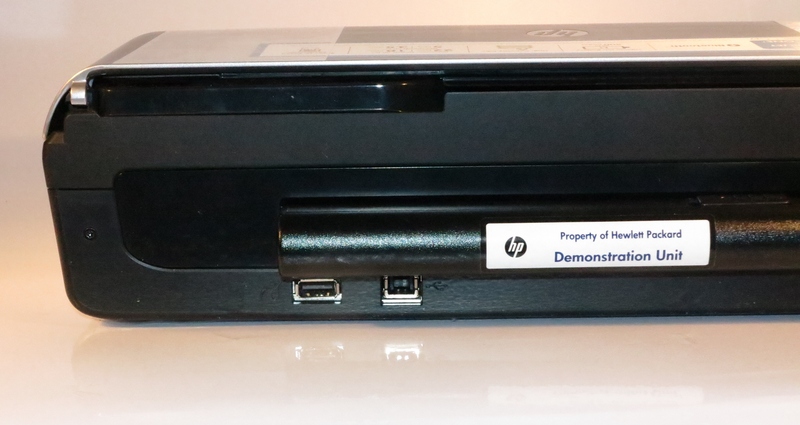 As well, one can also purchase from HP the “OfficeJet Mobile Car Adaptor” so you can run the printer off your vehicle’s 12V cigar-lighter socket, something I would consider very useful for those of you whose office is your truck or van. It would take the equivalent of four to five hours to charge the printer’s battery from empty to fully charged, which means that it could be ready to go after you wake up if you charge it overnight. 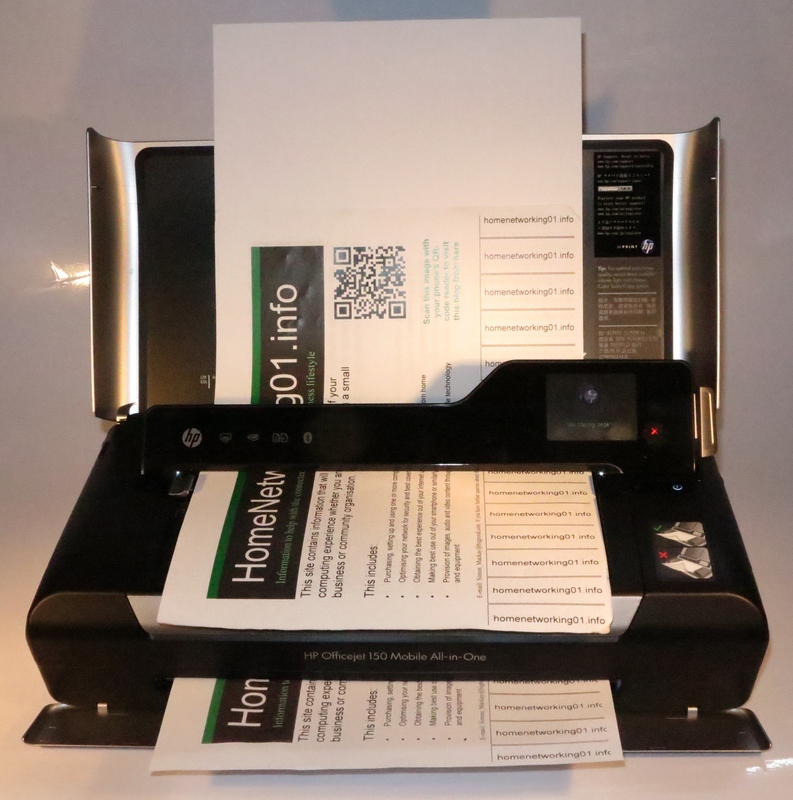 The HP OfficeJet 150 uses a small LCD touchscreen user interface for managing setup and walk-up functions. I find that this screen may be seen as being too small especially when you use the dialog boxes associated with the various operations. As well, I would rather that HP do implement the OLED technology for this printer’s display rather than the common LCD display. The copy / scan mechanism is a sheet-fed system similar to the typical fax machine and requires you to have the document with the text facing downwards and the top of the document towards the back of the machine. The OfficeJet 150 was able to print out an image from my Canon PowerShot GIX camera properly and smoothly using the PictBridge setup. This is good if you want a “quick print” of one or more images that you just took with your digital camera. You can also print from and scan to SDHC memory cards or USB memory keys using the control panel. The SD card slot is very difficult to find but is located on the bottom of left edge of the printer, up the back while the USB socket for this kind of printing is located on the back, close to the USB host socket which you use to connect this printer to the computer. The advantage of this is that you could scan all those receipts that are in your van’s glove box or those signed documents on that clipboard to a memory key or SD card, then transfer them out to your main computer when you get back to your office. Similarly, you could turn out the preview images from your digital camera to show your customer, again without needing to bring out your laptop. The HP OfficeJet 150 can connects to a computer via USB or Bluetooth but it cannot use the Bluetooth option for anything beyond printing. Of course, this printer can work with regular computer based on Windows or MacOS X operating environments. It can also print from an Android device if you load that device with Printshare. Other than that, there is very little support for mobile operating environments. The software installation experience was very quick although I downloaded the software from the HP site rather than using the supplied CD. This is so I can be sure I am running the latest drivers for this printer. It is infact also going to be the method one will have to use when loading the software on to any of the newer ultraportable computers that aren’t equipped with an optical drive. During initial setup, the printheads didn’t move to loading position instantly. Instead I had to turn the printer off and on to cause this to happen. As for installing the ink cartridges, you placed them in to their respective holders then closed the lids on these holders to cause them to be in the correct position. This didn’t require much force. When you scan or copy receipts, dockets and till-rolls, you will need to have the receipt in the middle of the scanning head and manually push the receipt in to the machine as you start the scan or copy process. You will need to “ignore” the dialogs that come up on the touchscreen about the document not being loaded properly by tapping “Ignore”. This is a task that I find that most users are likely to do as part of organising their expense receipts for tax or reimbursement purposes such as those fuel receipts that pile up in the glove box; or managing those payment-terminal or cash-register journal reports as part of your accounting and tax needs. One thing that confused me initially was the location of the SD card slot that is used for “print-from-card” and “scan-to-card” applications. It was initially hard to locate this until I looked up the supplied product documentation which mentioned that the slot was just about on the bottom edge of the printer’s left had side. This SD card slot would present itself as an extra disk drive in Windows or MacOS X. 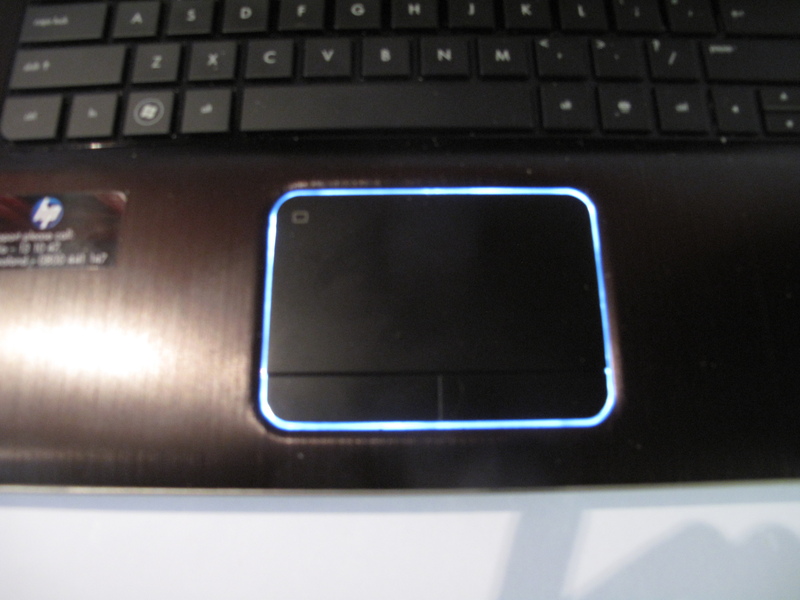 It is a bonus if you use an ultraportable computer like the Dell XPS 13 Ultrabook that doesn’t have an SD card slot. You also then benefit from an extra memory card slot which can come in handy for jobs like “upsizing” a MicroSD card by moving data to a larger-capacity card. The HP OfficeJet 150 had turned out clear crisp text at the typical inkjet printing speed when it was printing regular documents. This didn’t matter if it was connected via USB or Bluetooth. The scanning and copying speed was also very similar to what you would expect for most of the smaller fax machines. I have done the usual colour-photo printing test using the supplied cartridges rather than the photo cartridges. This is because most of us may find it harder to locate the photo cartridge at most stationers or won’t be bothered to buy and install that photo cartridge every time we want to print a photo. I assessed it against the previously-reviewed Canon PiXMA iP-100 mobile printer and noticed it yielded colours that were more saturated yet the image lost out on the contrast. As well this printer also yielded a relatively darker output of the same images compared to the Canon. It is also worth noting that the photo printing tasks tended to ask more of the printer’s battery life. Of course, the battery life that is rated in pages for these printers assumes that you turn the printer on for the task at hand, complete the task then turn it off before packing it away. 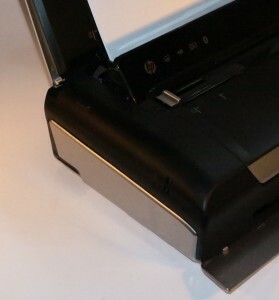 A limitation that I have noticed is that the HP OfficeJet 150 can have trouble printing an A4 photo when connected via Bluetooth. Here, it could “cut off” the printout very early and cause the host computer to resend the image for printing. As for receipt / till-roll scanning, the printer could have a second guide from the right in order to simplify this process or the scanner’s feed system can be optimised on the left or right to keep thermal-printed receipts from drifting while scanning or copying. Similarly there could be a “copy and scan” mode which scans a document to an SD card or USB memory key while copying it, which can come in handy when you have to turn out a customer copy while creating an electronic file copy of that work order. HP and other could move towards a 4-cartridge ink system for these mobile printers so that they are less costly to run when it comes to ink cartridges. This is a system that is commonly used with most regular-sized inkjet printers and has been considered more cost-effective due to the need only to replace only the empty cartridges. 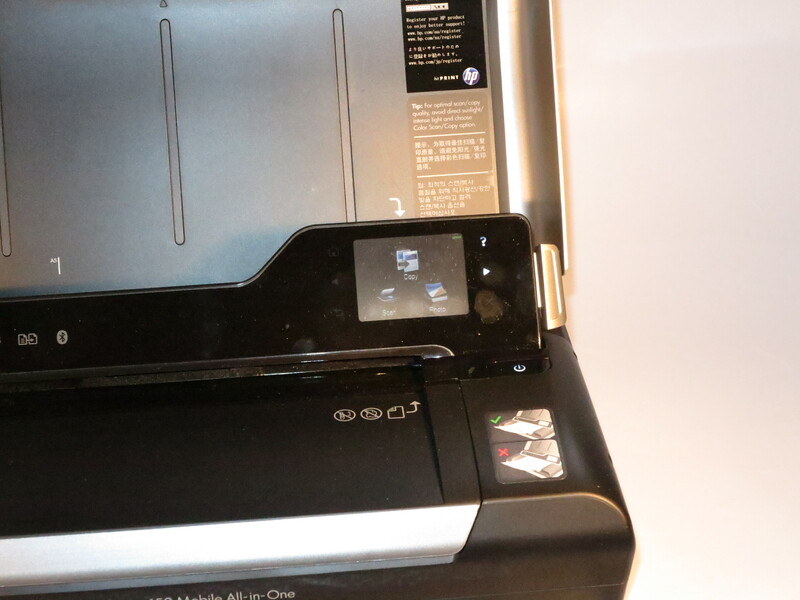 This printer could be able to support Wi-Fi printing through the use of an optional Wi-Fi connectivity kit. Here this could work via an existing Wi-Fi network or use Wi-Fi Direct for standalone mobile printing. This option would make it work with mobile operating environments like Apple’s iOS with its AirPrint function; as well as the ePrint Home & Biz apps available for iOS and Android. 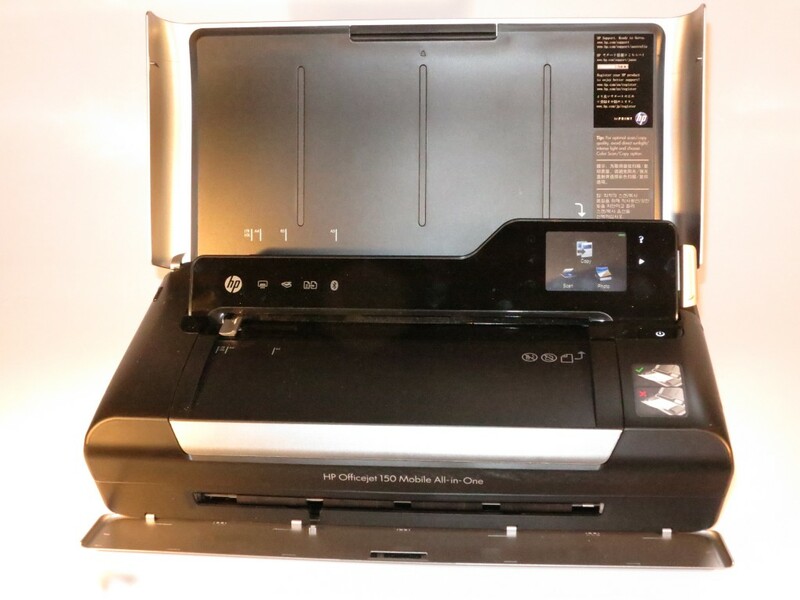 I would recommend that people who are needing to print, copy and / or scan hardcopy documents but want to avoid carrying many different accessories for each task buy the HP OfficeJet 150 mobile printer. As well I would recommend that those of us who use this printer as part of working out of the back of a vehicle like a van; or work from a small powerboat purchase the optional car adaptor. Here, you can charge the printer’s battery up while under way or avoid the worry about compromising battery life while printing or scanning near the vehicle. You wrote, “The advantage of this is that you could scan all those receipts that are in your van’s glove box…”. Have you personally scanned a receipt using this thing? For me receipts did not feed at all! It seems to only work for an original that is at least as big as size B5.